I’m against credit card company abuses in general. 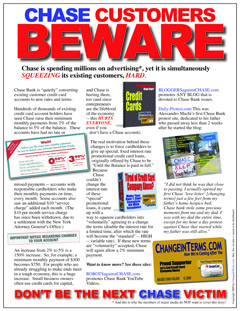 Most recently, I’ve been battling Chase Card Services for the right to survive. If you want the whole Chase “package,” here is a link to just about everything you might need to really grasp what’s going on as it pertains to my own struggle: the letters back and forth, correspondence with the OCC, the change in terms notice, the original 3.99% promotional offer — I think if you’ll read through this, you’ll get the picture. I prefer the contact form above rather than contacting me through my university. However, if you find it necessary to reach me on an urgent basis (i.e., you are “on deadline”), I am an Associate Professor of Entrepreneurship in the Center for Entrepreneurship and Innovation (CE&I), College of Business, at Western Carolina University.